If you're completely unfamiliar, Bloglovin' is a blog reader site that makes following & reading blogs easy and enjoyable. Before starting my blog I was using it for keeping up with all of my favorite blogs, now I use it to promote my own blog as well. If you're really into blogging and reading blogs, your "bookmark bar" can get real crowded, real quick. Bloglovin' takes care of that for you, allowing you to follow tons of blogs and scroll through what's called your "feed" with ease. You can find new blogs to follow based on your specific interests. Meaning others can discover YOUR blog searching their interests. Categories include everything from beauty, design, film & books, lifestyle, fashion, and so many more. If you're a new blogger, or a blogger looking to expand readership and exposure, Bloglovin' is the step to take. It exposes your blog to readers that may have never found it otherwise. In a very clean, picture-focused way, I might add. 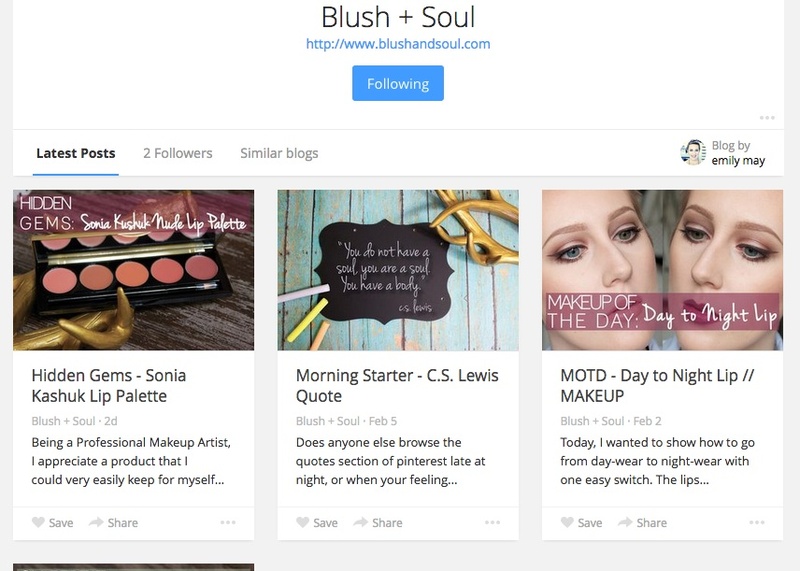 Bloglovin' allows you to 'heart' specific posts that then get saved and can be accessed from your profile to refer back to them easily. Reminds me of pinterest in that way. Besides the 5 I mentioned above, there are other features you'll appreciate too. So, whether you're a reader or a blogger, Bloglovin' is a goood thing, yall! So if you haven't already, go on over and create a profile so you can start making your blogging experience easier & better! Check it out. Don't forget, you can follow B+S on there too. Thanks in advance! I hope you've enjoyed the first week of Blush + Soul and are excited for what's to come!